Enjoy a Peak District Walk with Snap the Peaks, a photo guide to walking in the Peak District, illustrated with maps and photographs. Try a circular walk graded from easy to challenging or one of our shorter linear walks. How about an easy walk in the gently rolling dales of the White Peak or something more challenging on the edge of the Dark Peak? It’s all here take a look! 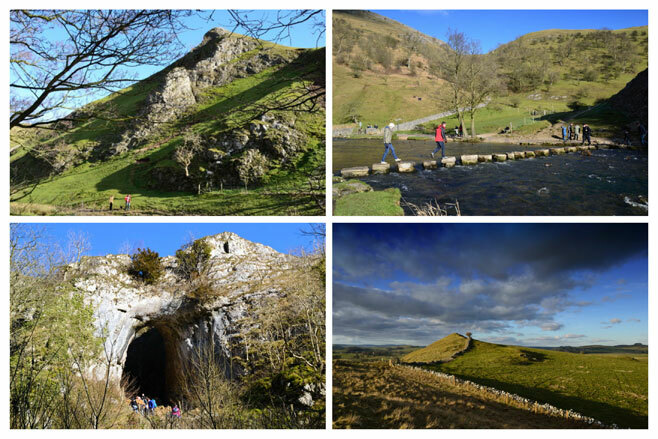 The featured Peak District walk this time is the Dovedale Circular Walk. The walk takes the usual route from the car park at Dovedale and follows the River Dove through Dovedale to Milldale. The walk crosses the stepping stones below Thorpe Cloud and visits all the popular spots en-route including Lover’s Leap, Reynards Cave, Lion’s Head Rock and Dove Holes. The return journey takes an adventurous route over Access Land high above Dovedale visiting the summit of Baley Hill with its impressive views north and south along the Dove valley.